WASHINGTON (CNN) -- Secretary of State Hillary Clinton said Monday that releasing pirates captured while attacking ships off Somalia's coast "sends the wrong signal." 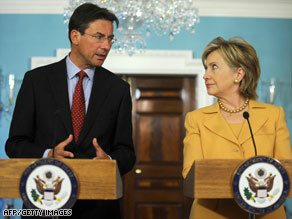 Hillary Clinton and Dutch Foreign Minister Maxime Verhagen talk after their meeting Monday in Washington. "There is a need to coordinate better the reactions of all of the nations and organizations involved in policing the coastline off of Somalia," Clinton said after a meeting with Dutch Foreign Minister Maxime Verhagen. Her comments came after Dutch naval forces captured seven pirates Saturday but were forced to release them because they lacked the jurisdiction to hold them. The capture came even as pirates were capturing another vessel -- a Belgian ship -- off the coast of the Seychelles islands. It happened after the pirates launched an unsuccessful attack on a petroleum tanker called the MT Handytankers Magic, said Cmdr. Chris Davies said from NATO's Maritime Component Command Headquarters in Northwood, England. After capturing the pirates, the Dutch forces found and freed 20 local fishermen who had been kidnapped by the pirates, Davies said. The Dutch disarmed the pirates, and released them, Shona Owe, a spokeswoman from the maritime headquarters, told CNN. Because the crew was on a NATO mission and not working under the European Union, the Dutch crew lacked the jurisdiction to hold the pirates, according to reports. "If the Dutch navy had been operating under the EU, they could have turned over the pirates for trial. NATO has not provided that authority," Clinton said." So we need to coordinate this, we need to move very quickly to do so, and we're going to work together in a leadership role to try to get this resolved." Last week, Clinton unveiled a diplomatic initiative to thwart attacks on ships off Somalia's coast and combat piracy, including efforts to track and freeze pirate assets, going after their land bases and strengthening international naval cooperation. The United States also will participate in upcoming meetings on Somalia and piracy. The steps announced by Clinton are part of a U.S. government-wide effort to grapple with the growing threat posed by pirates, exemplified recently by the attack on the the Maersk Alabama and last week's failed attack on another U.S.-flagged ship off the Somali coast.